Missed care, a relatively new concept in the medical community, refers to any part ofrequired patient care that is omitted of delayed. It’s not the same as a mistake or error, but like them, missed care can negatively affect patient outcomes. I want to share the case of a patient admitted into home health care for wound care. The case includes several areas of missed care from many different different sources. Ms. Smith (not her real name), an 83-year-old woman, lives alone in a senior apartment complex. She is alert, with no signs of dementia.Two months before her first home care visit, Ms. Smith hit her right ankle on a table and subsequently developd a non-healing arterial wound. Her left leg showed scars from a previous wound that was diagnosed as pyoderma granulosum. Ms. Smith was referred to a wound clinic for testing related to the non-healing right ankle wound. The testing showed that arterial flow was sufficent and there were no signs of infection. (See Arterial and venous wounds.) The clinic physician ordered compression for both legs. When Ms. Smith couldn’t tolerate a three-layer wrap, she was switched to a gauze bandage roll and ACT™ wraps and the wound began to heal. When Ms. Smith’s regular home care nurse could not make a visit, another was sent. After removing the wrappings, the nurse found a blister on the the left leg and documented the new wound in the patient’s medical record. The original wound on the right leg healed in the next 3 months, and the wound on the left leg progressed to almost complete healing. Ms. Smith didn’t feel comfortable with the wound center so her visits were cancelled. Her current home care nurse continued the treatment as ordered. The home healthcare agency continued with the treatment as ordered by the physician until the left leg wound progressively increased in size. Ms. Smith was then referred to another wound clinic, where she received debridement and collagenase as a wound dressing. The wound increased in size after each debridement unitl it covered more than half of the lower leg. The wound clinic physician told Ms. Smith he would not continue her care at the clinic. The physician said amputation was the only option and that the patient had dementia, making her unable to make her own decisions. Ms. Smith was upset at the idea of choices being made for her, as well as how the wound looked, so she called me to get advice. She accepted the recommendation to contact another physician, who discontinued the collagenase. Subsequently, the wound started to slowly improve. The fear Ms. Smith felt about her wound and how it looked was real. Left to continue with the same dressing and treatment, it would have continued to get larger. She could have lost her leg and then her independence. The missed care in this situation was the lack of the correct dressing, lack of communication related to changes in the wound, and lack of patient-centered care. Worsening of the wound can be connected to the healthcare system involved in Ms. Smith’s care. Her history of pyoderma granu­losum meant the dressing should never have included collagenase and the wound should not have been debrided. The home health nurses failed to communicate to the wound clinic and the primary care physician about how the wound was worsening. The wound clinic physician did not discuss options with the patient. Part of the reason for the missed care was the agency required nurses to visit too many patients. The visits had to be shortened with the lack of time to do what was needed for the patient. Too often in health care, financial pressure takes priority over patient care. So what can be done to avoid this type of missed care? The agency should monitor the nurses’ workload so adjustments can be made as needed, particularly because overwork can lead to errors. The nurses and agency should collaborate to ensure patients’ wounds are properly evaluated and that a healthy work environment is present. Kalisch writes that nurses with higher job satisfaction have fewer incidences of missed care. 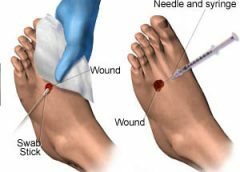 A wound care team, with a certified wound care nurse at the head, would help ensure proper asseement and interventions. The ideal team would include representatives from physical therapy, occupational therapy, dietary therapy, and nursing. Finally, any time a provider or agency decides to no longer provide full care, the patient must be given options for where alternative care can be provided and a detailed “handoff” of the patient to the new provider needs to be made. Ultimately, Ms. Smith left the wound clinic and was evaluated by other physicians. Since leaving the clinic and no longer having daily debridements, her wound has decreased in size and new epithelial tissue is forming at the wound base. Two of her three specialists have agreed that the leg can be saved, and Ms. Smith underwent a skin graft to promote additional healing. Calianno C, Holton SJ. Fighting the triple threat of lower extremity ulcers. Nursing. 2007;37(3):57-63. Kalisch BJ Landstrom GL, Hinshaw AS. Missed nursing care: a concept analysis. J Adv Nurs. 2009;65(7)1509-17. Kalisch B, Tschannen D, Lee H. Does missed nursing care predict job satisfaction? J Healthc Manag 2011;56(2):117-31. Tierney AJ. Editor’s choice. The concept of ‘missed nursing care’. J Adv Nurs. 2009;65(7):1355. Watson J. Human Caring Science: A Theory of Nursing. Boulder, Colo: Jones & Bartlett Learning; 2012. Trinite T, Loveland-Cherry C, Marion L. The U.S. Preventive Services Task Force: an evidence-based prevention resource for nurse practitioners. J Am Acad Nurse Pract. 2009;21(6):301-6. Lydia A. Meyers is traveling wound care nurse. She is currently working in the state of California.